Teosyal® Pure Sense Ultimate is the most intense and longest lasting of the Teosyal® range. Teosyal® Ultimate is the ideal product for the perfect remodelling of the face due to its high volume creating capacity. 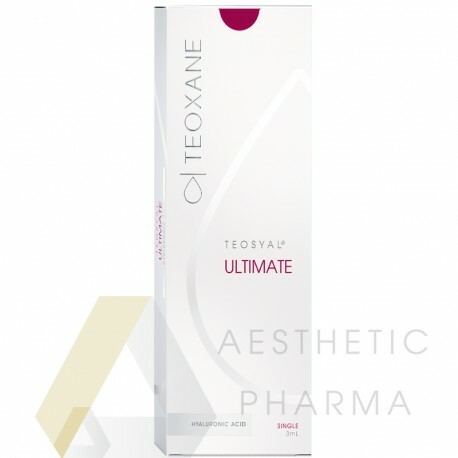 This can achieve amazing results, and is recommended for use in the upper cheeks, the temporal region, marionette lines, the nose, the chin, the mandibular line and the eyebrows. It is not recommended for use in the lips as the product is just unsuitable for the comparatively less intense treatment needed to plump such a small area. The injection for this product is never injected into the dermis, unlike many of the other Teosyal® products. Instead, it is normally injected deeply in a concave area of the subdermal layers of skin in the face. This may sound a little bit scary, but because Teosyal® Ultimate is designed to completely remodel the face, it is necessary to inject into the optimum place to get the most out of the treatment. The use of this product always requires a thorough knowledge of the facial anatomy and an extremely careful inspection of each individual’s facial architecture. needles: 2 x 23G "ultra thin wall"